Orbital wall prostheses are intended for the treatment of orbital wall defects resulting from fractures of mid-facial area of the skull. Codubix® Orbital Wall is an implant intended for the treatment of orbital wall bone defects. The graft is manufactured with knitting technique out of polypropylene yarn which is characterized by low specific weight and easy shaping and forming which enable giving the implant its adequate rigidness and hardness. High resistance, low specific weight, hydrophobicity contributing to lack of physiologic liquids absorption, non-toxicity, and chemical inactivity make Codubix® Orbital Wall easy to identify with natural orbital wall bone in terms of physical properties. Codubix® Orbital Wall grafts can be easily modelled during the implantation and allow for diagnostics without artifacts. Codubix® Orbital Wall CT – upon individual order – individually shaped on the basis of CT scans. Knitted Codubix®Orbital Wall orbital wall prostheses are intended for the reconstruction of orbital wall bone defects (zygomaticomaxillary-orbital fractures, isolated fractures of orbital floor) caused by mid-facial skull bone fractures resulting from trauma or other causes. The Codubix®Orbital Wall implants are sold sterile - sterilised with moist heat (STEAM) in validated process in acc. with the requirements of PN-EN ISO 17665-1. Microbiological purity determined in acc. with PN-EN ISO 11737-1; accepted limit: max. 100 microorganisms/1g of the device. Before the sterilisation process periodical tests of microbiological purity of random-chosen products are carried out; such procedure guarantees full safety of the product. Codubix®Orbital Wall grafts fulfill all the normative requirements described in PN-EN ISO 10993-1 and possess documented biological tests. Permanganate oxidability – an important parameter of chemical purity. It shows the level of contamination, mainly organic, but also some non-organic, such as iron salts (II), sulphides or nitrates (III). The level of permanganate oxidability in serial devices is less than 0,1mg O2/g. Reference - clear water is characterised by the oxidability not exceeding 4mg O2/dm3. Size – different dependingly on chosen variant – enable appropriate fitting/modelling of the implant's shape. Thickness – depending on chosen variant: approx. 1mm – ensures appropriate stiffness of the graft. Resistance to pin puncture – min. 0,15kN – ensures appropriate strength of the device. 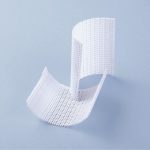 Codubix®Orbital Wall grafts are packed in double medical packages (fulfilling PN-EN ISO 11607-1 requirements) - paper-foil sleeves with a fold, adequate for EO sterilisation. On the outer packaging there is a TAG label (easy to peel-off, self-adhesive, identifying the device). The double package enables introducing the device into the operating room without losing its sterility; moreover, the transparent package enables having a look into it and inspecting the implant. A sterile implant is packed into double medical packaging with IFU and additional double TAG label included is placed in a cardboard box. Such package ensures safe storage within the guaranteed validity period.